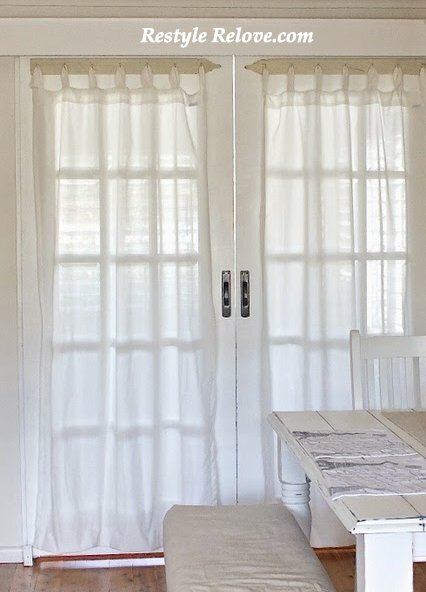 I recently stripped back my white sliding french doors to their natural woodgrain. I love the contrast they provide to an otherwise very white lounge/dining room. I just finished repainting the walls in Dulux Limed White. It is a gorgeous shade of white that looks like a taupe/stone sort of colour. I also just made this new office sign from a plank of old wood and a printed stencil. This is what you used to see. Besides stripping the doors, I removed the curtains and old paling curtain hangers. I usually keep these sliding doors closed, but with such a cosy new farmhouse style office and beautiful contrasting woodgrain french doors, I think they will be staying open more often. It looks great Julie, I love the black and white combination and the little Office sign you made is cute!! :o) I bet that was a pain to strip those doors... the result is beautiful though. Thanks Tania. Yes, those doors were not fun at all! But I've had a bit of practice, lol. I wish I didn't change my mind so often. Exactly what I was thinking, big pain to strip sliding doors back to original wood, so effective and very nice looking. Taking curtains down makes big very nice difference. Good to have changes once in while, refreshes our homes which you make look so beautiful. Your little Office sign is perfect.